Within the many parks and trails we manage you can find hidden treasure. Not the gold and silver that wayward pirates might have lost but something just as fun to find. 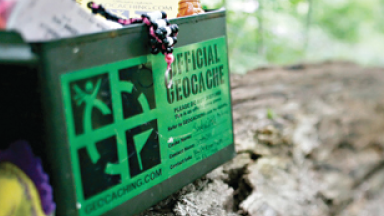 Geocaching is a fun and exciting, family friendly activity that you can participate in year-round. Below you will find more information and helpful links about caches hidden within our parks. How do you pronounce "geocaching"? You pronounce it Geo-cashing, like cashing a check. The word Geocaching broken out is GEO for geography, and CACHING for the process of hiding a cache. So what's the big deal? You gave me the coordinates so I know where it is. Seems pretty easy. It is deceptively easy. It's one thing to see where an item is, it's a totally different story to actually get there. A GPS unit is a electronic device that can determine your approximate location (within around 6-20 feet) on the planet. Coordinates are normally given in Longitude and Latitude. You can use the unit to navigate from your current location to another location. Some units have their own maps, built-in electronic compasses, voice navigation, depending on the complexity of the device. You don't need to know all the technical mumbo jumbo about GPS units to play Geocaching. All you need to do is be able to enter what is called a "waypoint", where the geocache is hidden. The location of a cache can be very entertaining indeed. As many say, location, location, location! The location of a cache demonstrates the founder's skill and possibly even daring. A cache located on the side of a rocky cliff accessible only by rock climbing equipment may be hard to find. An underwater cache may only be accessed by scuba. Other caches may require long difficult hiking, orienteering, and special equipment to get to. Caches may be located in cities both above and below ground, inside and outside buildings. The skillful placement of a small logbook in an urban environment may be quite challenging to find even with the accuracy of a GPS. That little logbook may have a hundred dollar bill in it or a map to greater treasure. It could even contain clues or riddles to solve that may lead to other caches. Rich people could have fun with their money by making lucrative caches that could be better than winning the lottery when you find it. Just hope that the person that found the cache just before you left a real big prize! A variation is to have a trackable item, which is an item that you can move from cache to cache. An example of this is a candle that has traveled from Australia to Arizona, and a Mr. Potato head that leaps from cache to cache. For example you can purchase a Groundspeak Travel Bug, which is a tag that you can attach to an item so you can track its movements through the Geocache web site. It all depends on the location of the cache and its impact on the environment and the surrounding areas. Caches could be permanent, or temporary. It's up to the cache owner to periodically inspect the cache and the area to ensure that impact is minimal, if not nonexistent. When you find a cache, it's always a good idea to let the cache owner know the condition as well. If you visit a cache location and the cache is missing, always make sure to log the cache as "not found" on the web site so the cache owner knows. If you notice that the logs show an unusual number of "not found" logs, please inform the Geocaching web site so they can check on the cache page. The cache can be temporarily disabled so the cache owner can check in on it. Sometimes, though rarely, when the cache owner cannot be contacted they can either allow folks to adopt the cache or have the cache removed completely from the site. They rely a lot on the Geocaching community to let them know the status of caches in their area.